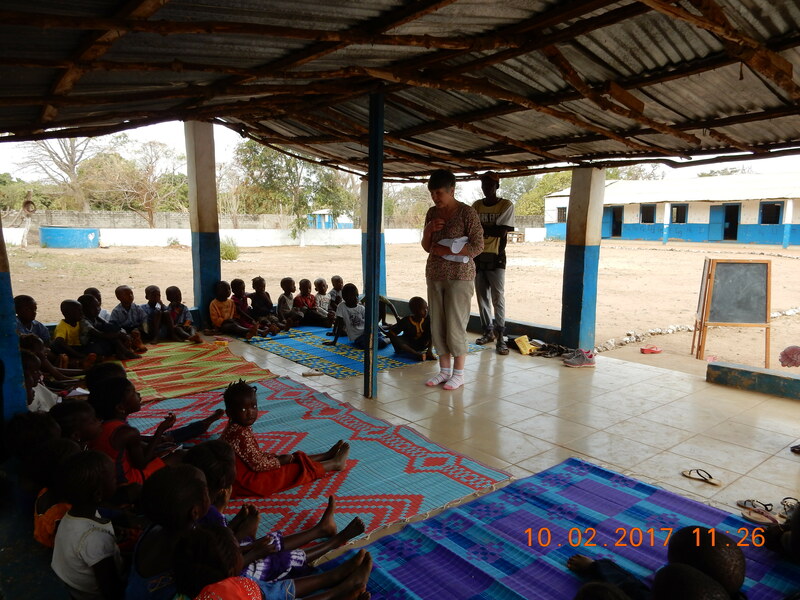 February – we arrived to find the school with 70 + pupils each day we were there. 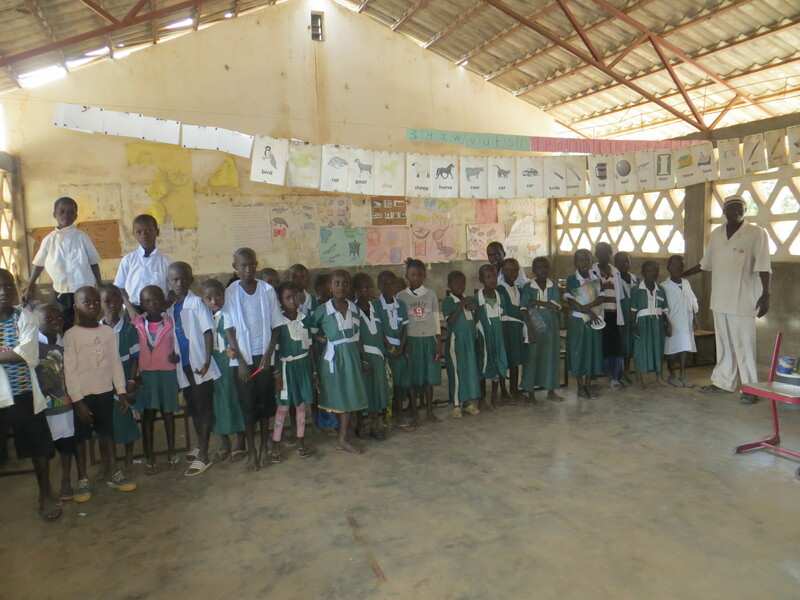 We are happy with progress so far, we took back the support of the school last September. There is much to do, but we have provided the basics they need, and in April we are going to have some roof and wall repairs done – before the rainy season starts. 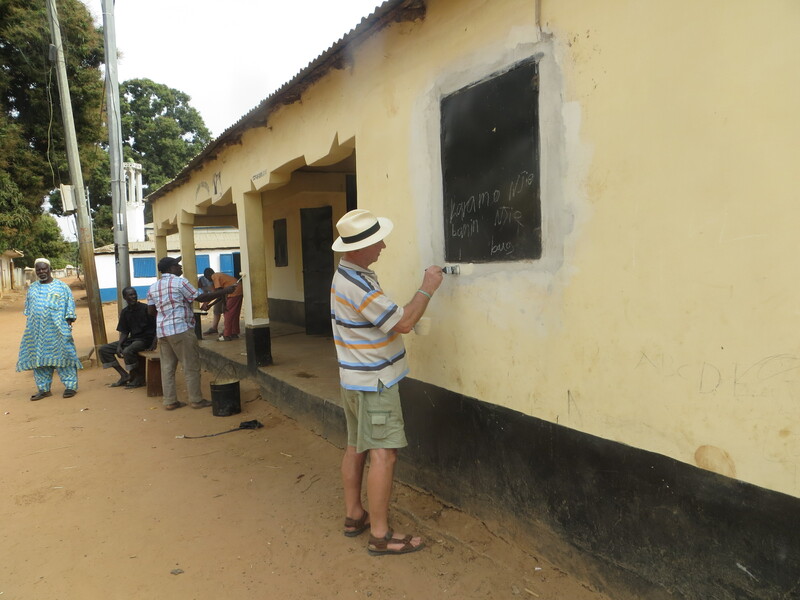 The front wall of the school has been newly painted by Marje, with Gary’s assistance….the teachers blackboards and the individual blackboards have all been newly painted with the help of Bakary! 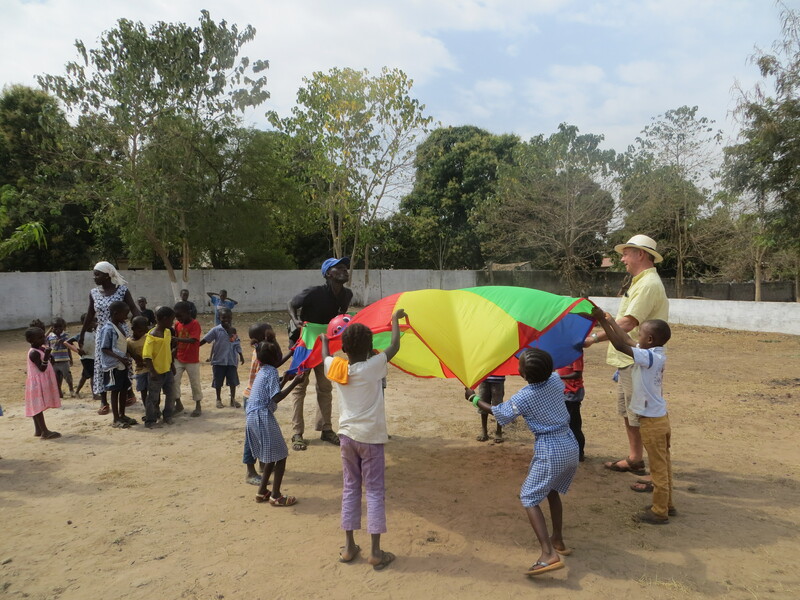 Andrew and Frances did a great job in helping and having fun with the children, Tombolu was unable to be at school at that time so Sue helped with the cooking. Once the repairs have been done we need to replace the school furniture and provide school uniforms, all of this we are working towards getting as soon as we possibly can. December ..… The school is progressing well, all planned repairs have been done, plus the roof of the pavilion has now had its roof replaced. New tables and chairs have replaced the old ones, there are more mats for the nursery classes, and further supplies for the children and teachers have been delivered. 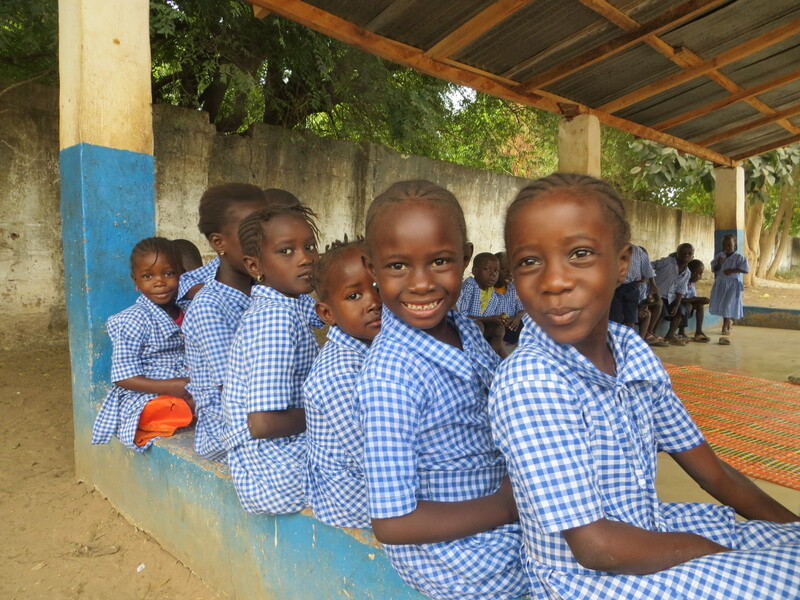 School uniforms were made for all the children, and this really does help to encourage the children to go to school…. 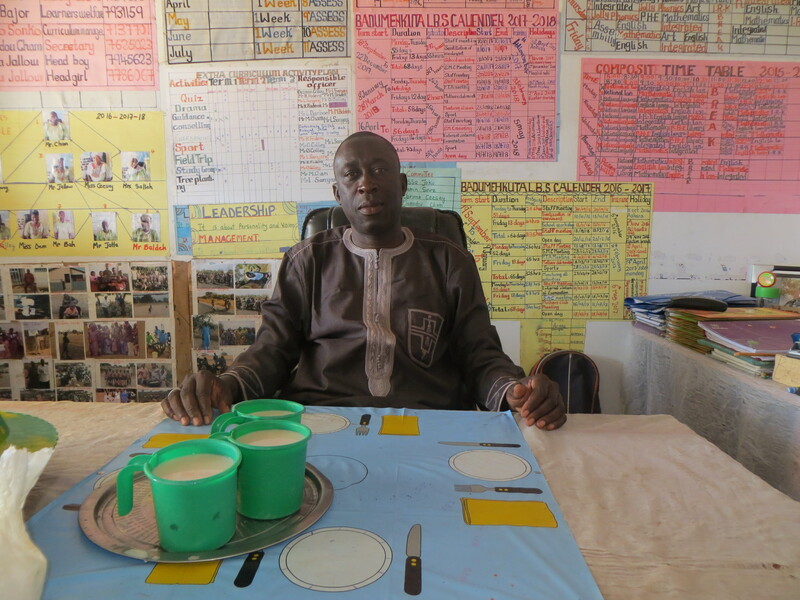 plus the meal cooked for them at lunchtime. We have now taken on a caretaker, he is well qualified for the job with many years experience, we know that this will really help with the running of the school. There are 90+ children attending school, and the teachers are working hard. We do have some further repair work to do – the toilet doors need replacing, so this will be done very soon. We are also having a further 30 blackboard slates made, and we are very lucky as these are going to be given as a donation! The teachers showed us the beans and groundnuts they had harvested which are supplementing the rice cooked for lunch. There are more varieties of fruit and vegetables planned for the school garden. We provided some exercise books to three schools, and we are currently distributing reading books for school libraries. February – The nursery class needed some mats for the younger ones, so we purchased 4 large matsfor them. There are currently 167 pupils in the school, and another 37 in the nursery class. The headmaster was pleased that the education ratings for the school have improved. December – We ordered more exercise books which have been delivered for the school, with a further 400 for the new term in the New Year. We are going to replace the inverter for the solar panel. 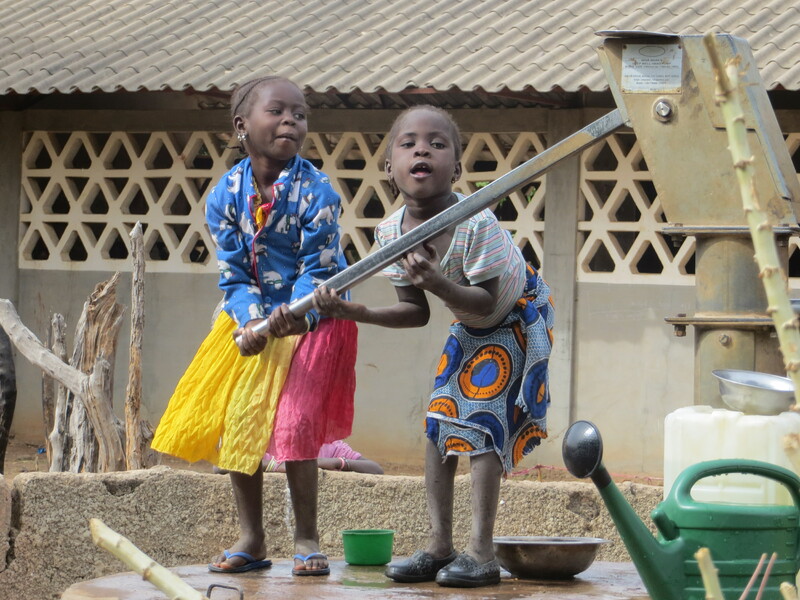 The school garden has many seed beds set out in neat rows, and the children themselves are tending the gardens. February – This year we have provided some books and boxes of stationary, and last term they received exercise books as well. Mr Cham sends his thanks and is very grateful. December – The school looks wonderful, Mr Cham has worked miracles it seems, he is justifiably proud of the school’s achievements. The wall we had built has been painted and just looks amazing covered in pictures. 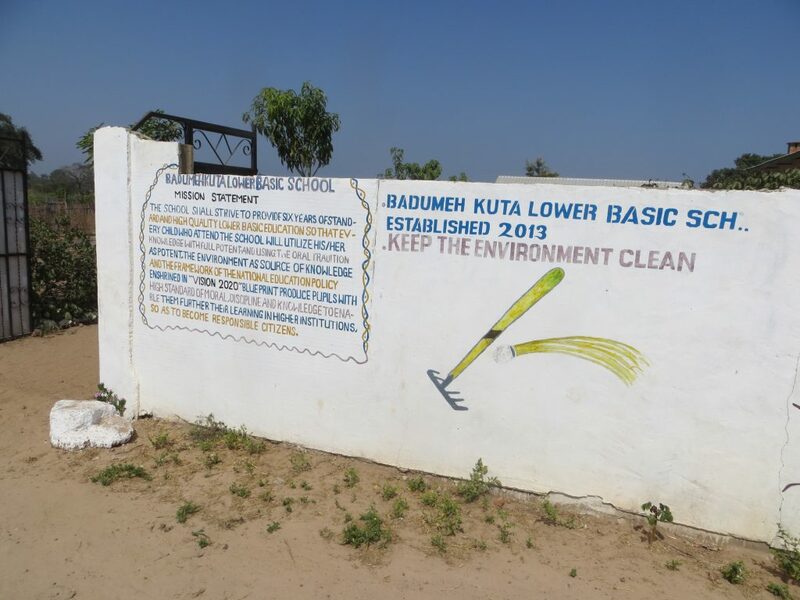 The walk from the school gates into the school itself is lined with plants, all carefully tended by the villagers themselves, they come in regularly to clean the school area and make sure it is kept perfectly. 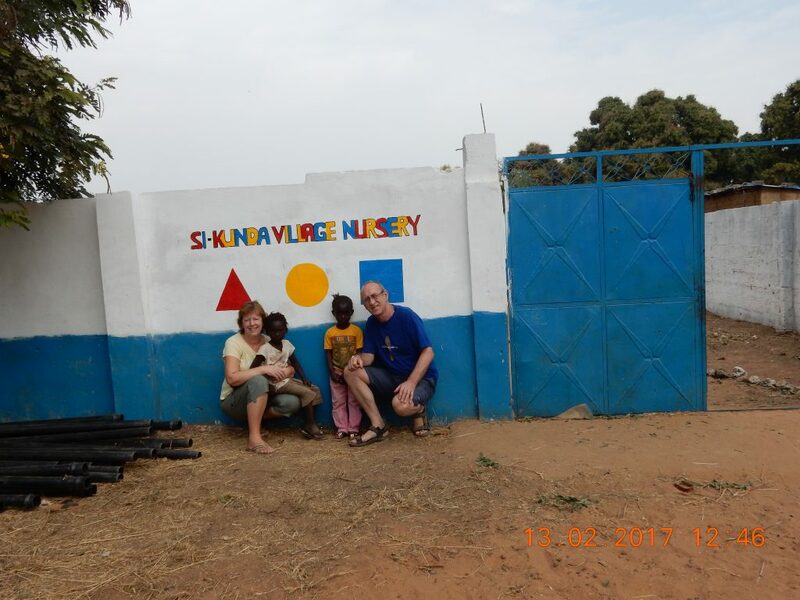 The children every morning clean up any rubbish, and there is some building going on to have another classroom, there are now 337 students, having grown rapidly since the 120 it had at the start almost 4 years ago. . The school was entered into a national competition for schools, and consequently came 3rd in the country on the first time of entering, a great achievement by dedicated staff and such a supportive community. 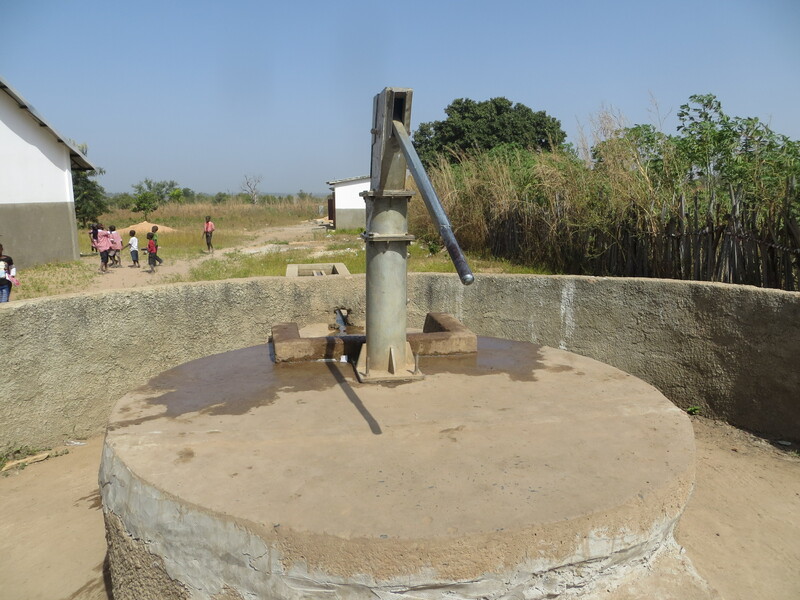 The school well had a problem a month ago, it needed a new cylinder, and the concrete top had to be broken to enable the teachers to get to the water. So our project manager made arrangements to have all the repairs done, and by the time we arrived it was again in full working order. The donkeys and carts are well used, and invaluable to the school. 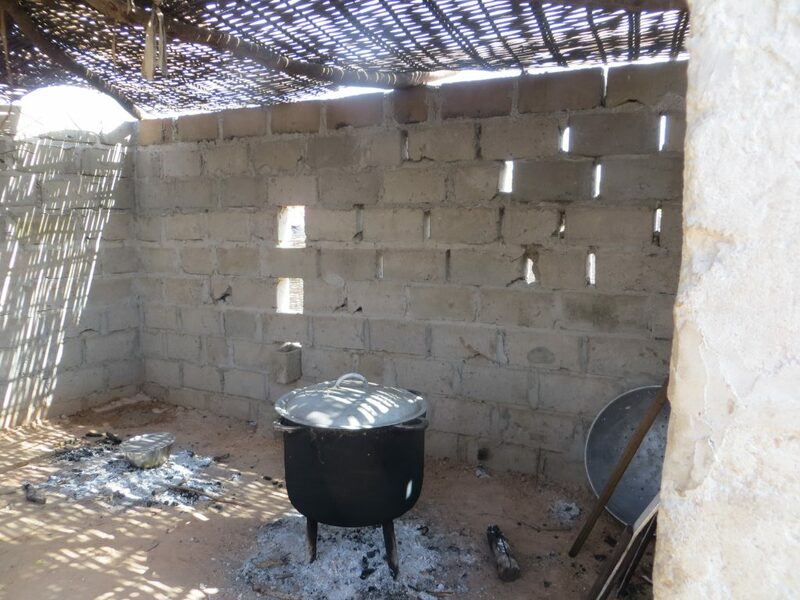 Our next project at the school is to put a roof onto the kitchen, at the moment it is made of grasses and reeds, so not only unsafe but will collapse when the rains start again next year. Since our February visit we have provided the centre with some chairs, adjustable swivel chairs on wheels. These were much needed, particularly in the laboratory. We will be sending some medical supplies in our next shipment….. December – supplies from the shipment were delivered last month, and this month some further medical supplies were taken.